It had been nearly 2 weeks since we discovered our hive had swarmed, and while we were still left with over 30,000 bees in the hive, we needed to give a little bit of time for the new queen to get established, take a few mating flights, and get busy laying her eggs. 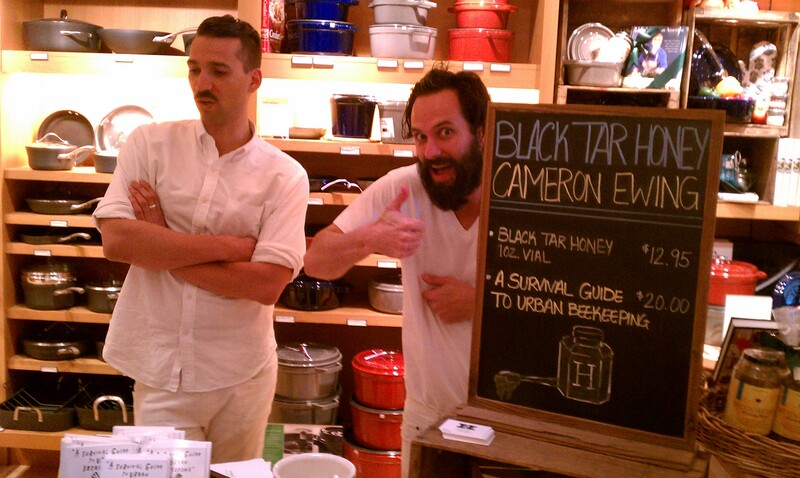 With the waiting period over, Cam and I undertook the deepest dive we’ve ever made into the hive. 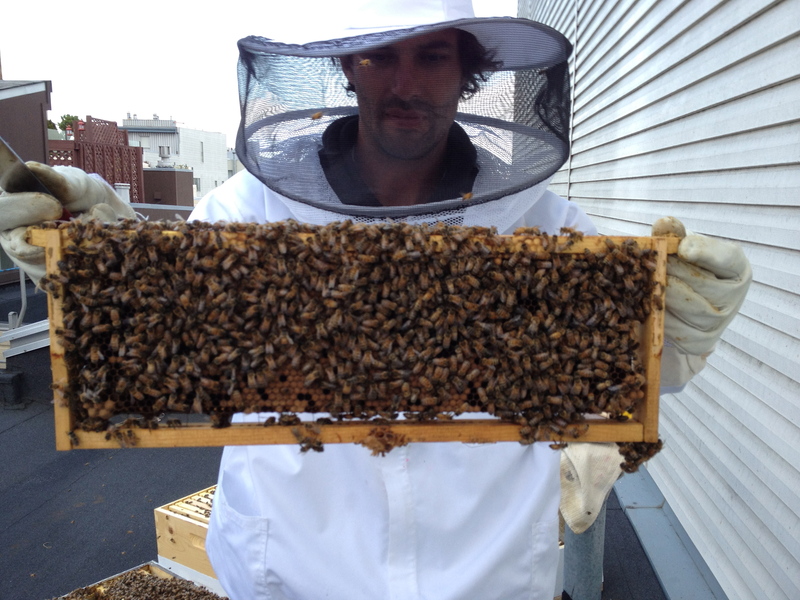 We had 4 supers in the hive AND a top-feeder (where we had placed the excess comb and honey from the last visit). So this meant that we were going 5 levels deep. The purpose of this visit was to get to the bottom super and inspect the egg laying pattern of the new queen to understand whether she will be a strong queen (as defined by being able to lay enough eggs). 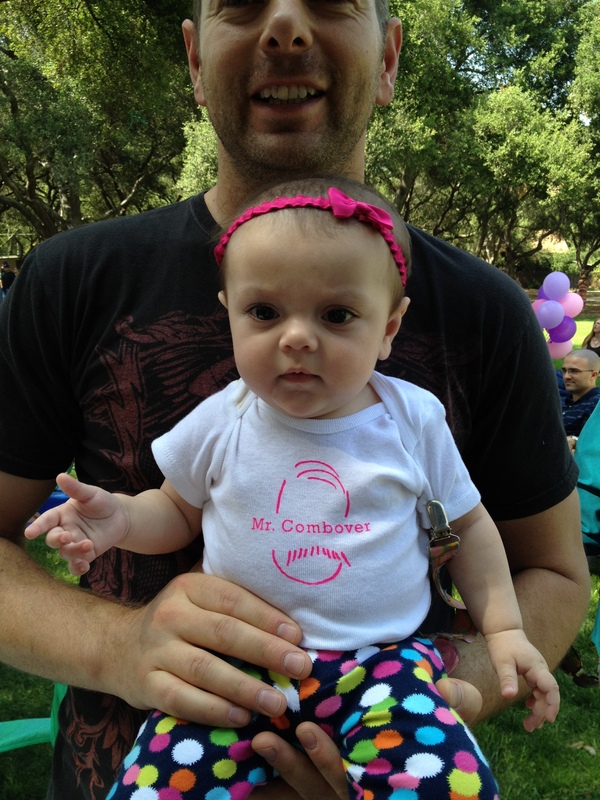 Mr. Combover holding one of the frames. We removed the top feeder which had a lot of bees in it. We set it aside after scraping the excess comb out of the box. The reason we don’t want excess comb in the box is that the bees will then try and fill it with honey, but because it is not built on a frame, we will be unable to harvest. With my new learnings from Bryon at Her Majesty’s Bees I confidently scraped the excess comb into a comb-box (an old shoe box) where we’ve taken to storing all the scraped comb – a better solution than just scraping onto the roof! After cleaning out the comb, there were still about 100-200 bees in the top feeder just hanging out. We set it aside at an angle and let the rest of the bees find their way back to the hive. We removed the top feeder all together on this visit and not put it back on. Step 2: Get in There! Super #4: We had 4 Supers in our hive. 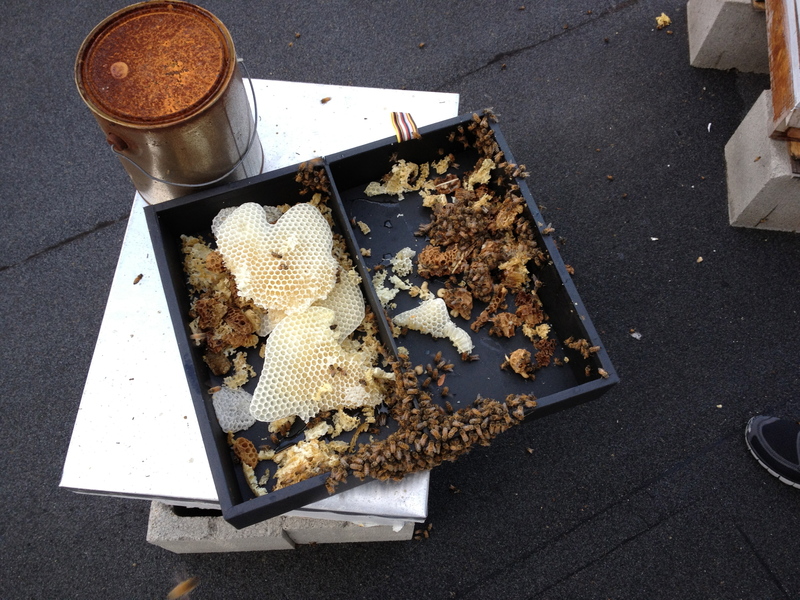 The top box was completely filled and capped with honey! To lift it off was a challenge since it was stacked so high at nearly shoulder height. The Super weighed at least 40 lbs. – likely more with all the bees in it and capped honey. This Super is ready to be harvested but we decided to wait a few weeks before renting the equipment to harvest for the benefits of economies of scale. Super #3: As you may remember from the last visit, we placed a brand new Super with 8 new frames as the 3rd Super in the hive. Just two weeks ago, this Super was completely new and empty, now, just two weeks later, the frames were all built with comb, and nearly four of the frames were filled with honey and starting to be capped! This was exciting progress, although, with being at the peak of honey production, not altogether surprising. Likely two more weeks and this Super will be ready to harvest along with #4! Super #2: Supers #3 & #4 were all honey and comb, but as we get to Super #2, we’re entering into the queen’s territory. Along with the bottom Super, this is where the Queen lays her eggs. The frames are a much different color, dark chocolate brown. This was also a milestone because to-date in our year of being beekeepers, we had never dived into the brood Supers where the Queen lays the eggs. We had always inspected only so far as the honey supers, trusting the Queen had everything under control in “her” Supers since there were plenty of bees, etc… Needless to say, these supers were packed to the brim with bees and we immediately noticed that they had built comb on the exterior wooden frames which are not intended for comb – a clear sign they were short on space – and a clear sign that, had we been more diligent in our visits, we could have identified earlier, so as to avoid the swarming of the bees. The visit started to get intense at this point, as we got closer to the Queen, the bees started getting more and more inquisitive and active in checking us out. This was probably starting to feel like an invasion vs. a visit for them. 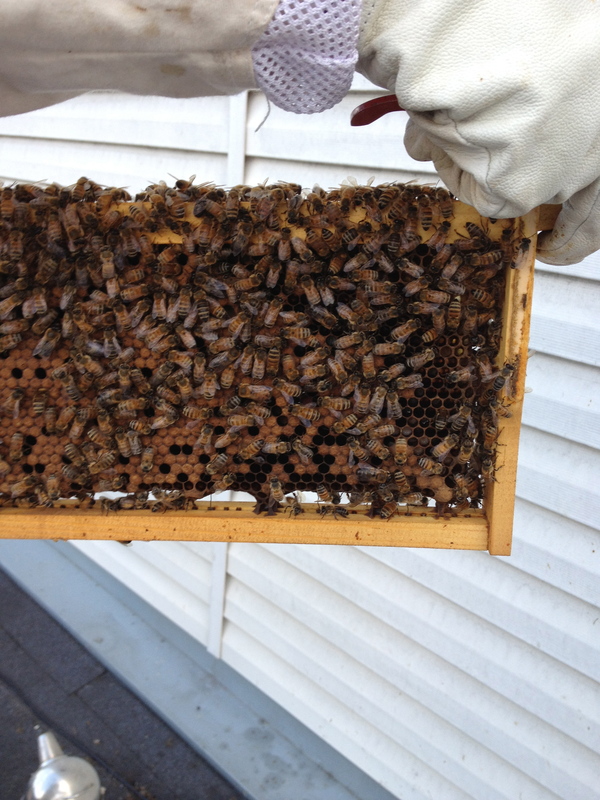 We stayed focused, inspected the frames, and diligently cleaned off excess comb where possible. Overall, the egg laying pattern looked intermittent, and quite honestly, without having closely inspected the egg laying pattern on past visits, it was challenging to understand whether the pattern looked “good” or not? In general, we understood that the more closely packed the capped brood cells looked, the more healthy the Queen’s strength. 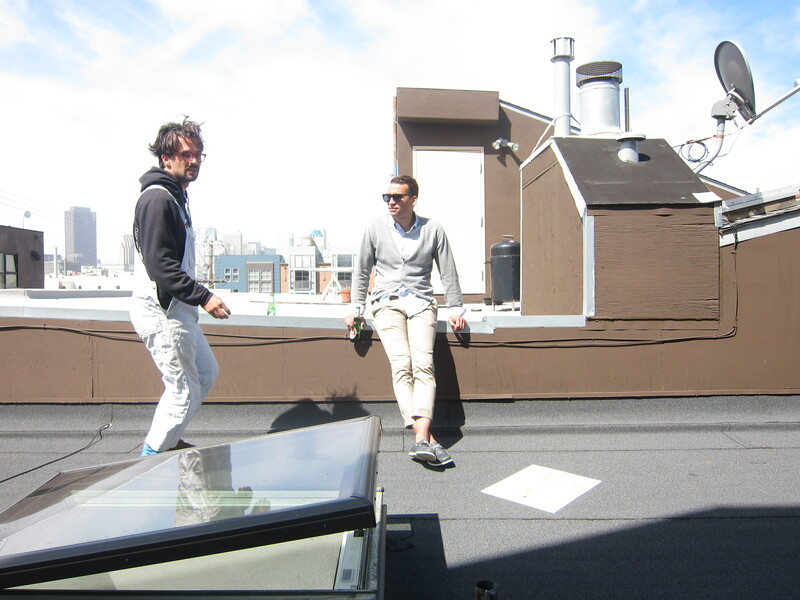 Here is Cam, having just set Super #3 on the roof, so we can begin to explore into Super #2. 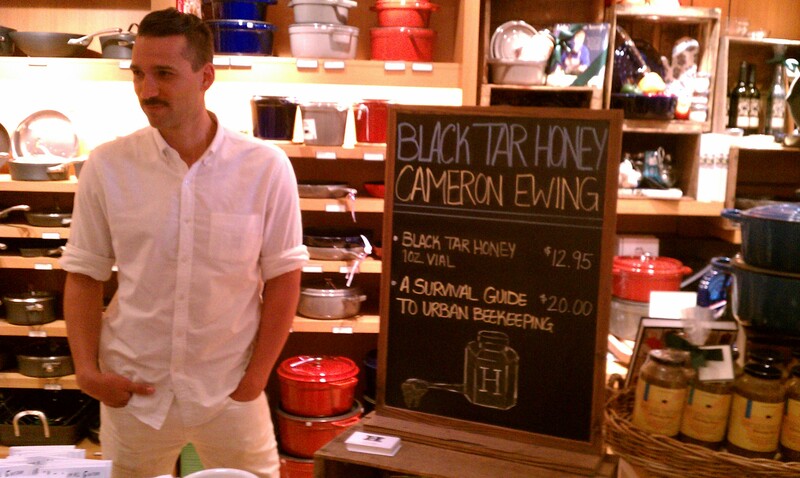 Look closely, you can see all the bees that have taken an interest in Cam and his activities. At this point there were hundreds of bees in the air, flying around Cam and Mr. Combover. This photo was taken about 10 seconds before Cam’s first sting of the visit. Super #1: As if going 3 deep wasn’t enough, we were now entering the bottom super, likely the Queen’s layer! This was our first time here. 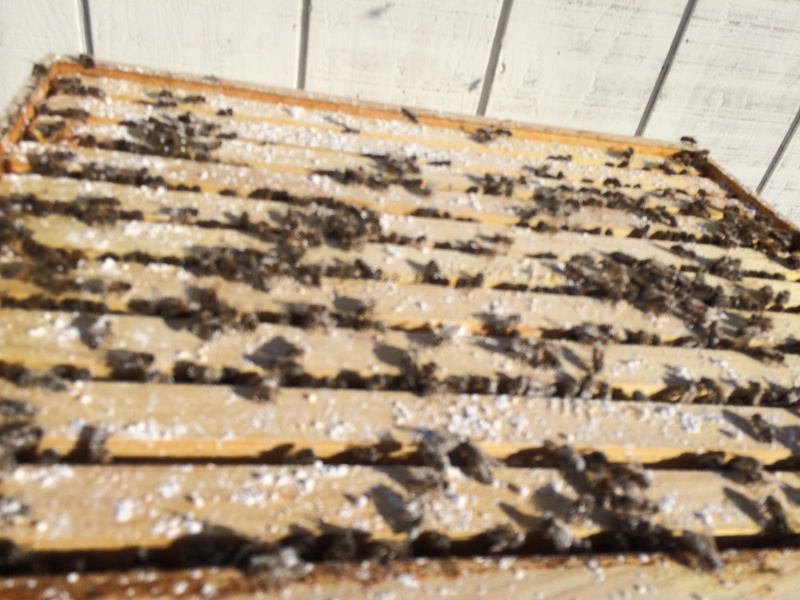 The bees reached a new level of frenzy which gave us a good indication that the Queen was near. At this point Cam was stung on his black socks. A quick yell, a quick hop, a quick walk away. Settled down, he returned as the good soldier he is. Here in Super #1, we started to inspect the frames and immediately recognized what Bryon had taught us were swarm cells hanging on the bottom of the frames. These were remnants from the previous swarm of a few weeks ago. We scraped them clean, took some pictures of the brood pattern, and very quickly started to lose our confidence. I don’t want to use the word panic, but with Cam having just been stung, the bees in a frenzy, and an overall overwhelming feeling of having 3 Supers open around us, and bees everywhere, we decided rather than try and go frame by frame and try and identify the Queen (what we should have done), we would take a few pictures and bring them to Bryon to ask his opinion on the egg laying pattern and thus the strength and viability of our Queen. I’m sitting in the bedroom with my wife trying to solve world peace and all of the sudden Mauri looks out the window and screams “SWARM!” As I look out the window I see 30,000 bees flying in all directions, the closest analogy I can use is a cartoon tornado. My initial reaction was awe at the sight of that many bees in frantic motion. My second reaction was panic – what do I do? What happened? Are those my bees? 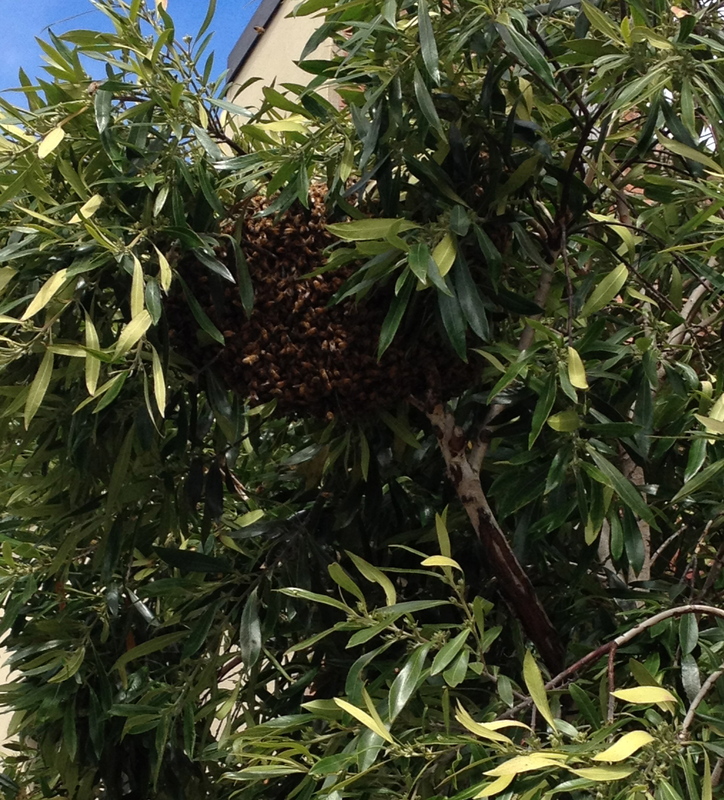 As it would happen, the swarm found a branch on a tree outside my window and all settled into a big ball of moving, buzzing bees. It was an incredible spectacle of nature to see chaos transformed into order in a matter of minutes as they re-grouped around the queen in the tree. The swarm lands in a tree. 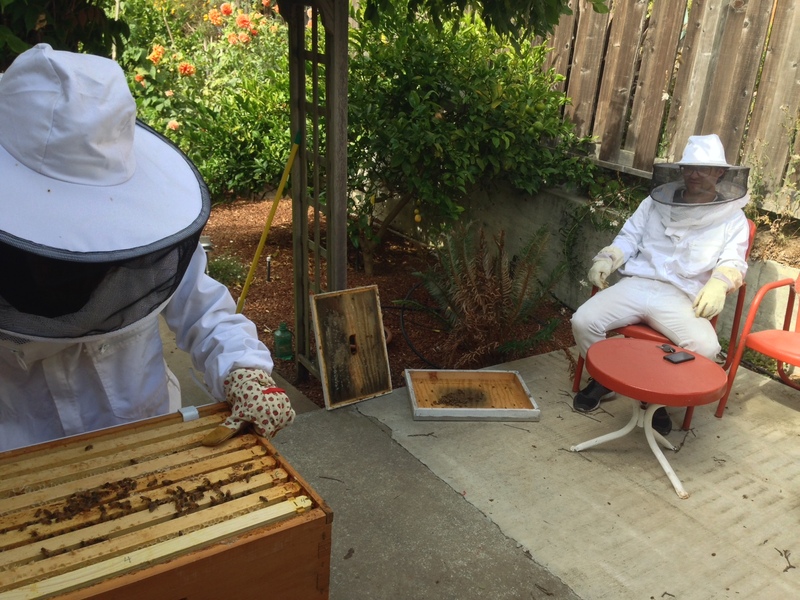 Being the awesome professional amateur beekeeper that I am, I did what you’d expect – I panicked – then I called Brian who is the local shopkeeper at his store Her Majesty’s Bees here in San Francisco. I explained the situation and asked him what I should do. 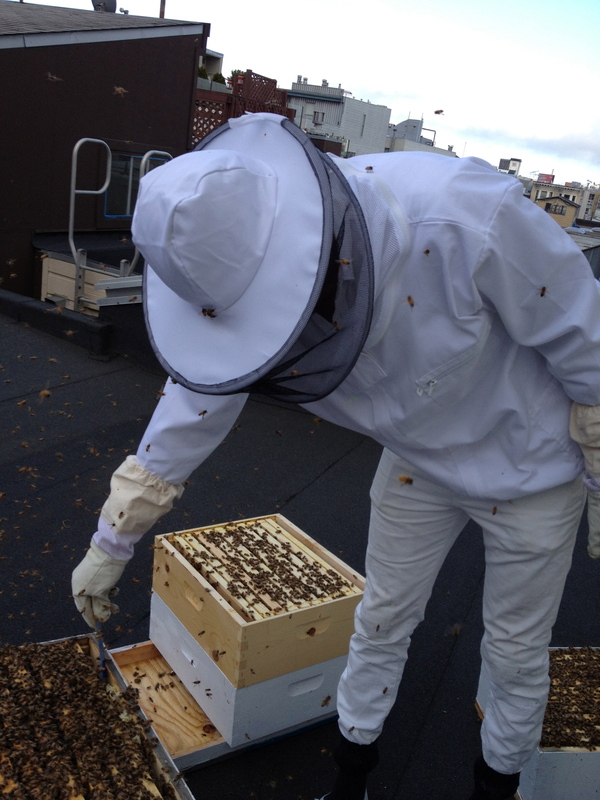 He first asked if I had a cardboard box, then he started to tell me how to approach the hive to re-capture it. I immediately cut him off, and told him I had no intention of approaching that swarm myself! Was there someone I could call? Could I pay someone to deal with this?! He offered his own serves. He got someone to watch the shop and came over right away. Cutting the Swarm from the Tree from justin kerr on Vimeo. 1) Brian is wearing short sleeves and no protection. 4) Brian was amazing. He cut the branch that the swarm was attached to, and removed it to place it in the cardboard box he brought with him. Shake It (Like a Branch filled with a swarm of bees) from justin kerr on Vimeo. 2) Bees are naturally defensive, so they usually only sting you for 3 main reasons: defend the brood (the eggs), defend the hive, and defend their physical safety. In the case of the swarm, the first two reasons to sting you are not in play as they have no brood and no hive to defend, therefore, amidst the seeming chaos of the swarm, you are actually the safest you could be around bees. 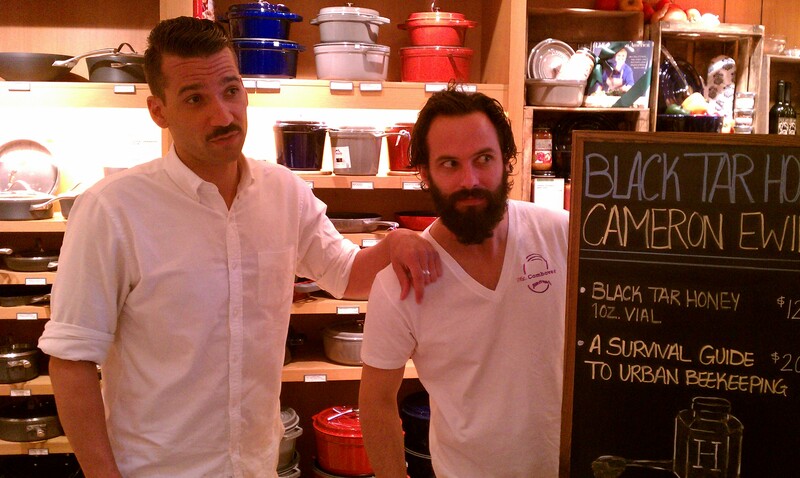 It took Brian’s confidence and ease to inspire the same in me. Trust me, I was freaked out seeing that huge swarm! 3) The number one reason that bees will swarm is that they are over-crowded in their current living space. In this case the queen, and a majority of the hive will take flight to find a new home. They usually will land locally in a short amount of time as a temporary resting spot while select bees survey the surrounding area to identify a preferable location. This can take minutes or hours. 4) Throughout the swarming process the bees number one concern remains the protection of the queen and staying close at all times, so once you actually get the queen into the cardboard box, the rest of the 29,999 bees will follow quickly. Brian even said that sometimes, if the queen is marked, he will simply stick his hand into the swarm, pull out the queen, place her in the box, and then stand to the side as the entire swarm voluntarily fills into the box. Wow! I am going back into the hive tomorrow to check on the aftermath. Likely there are still 10-20,000 bees still in the hive. 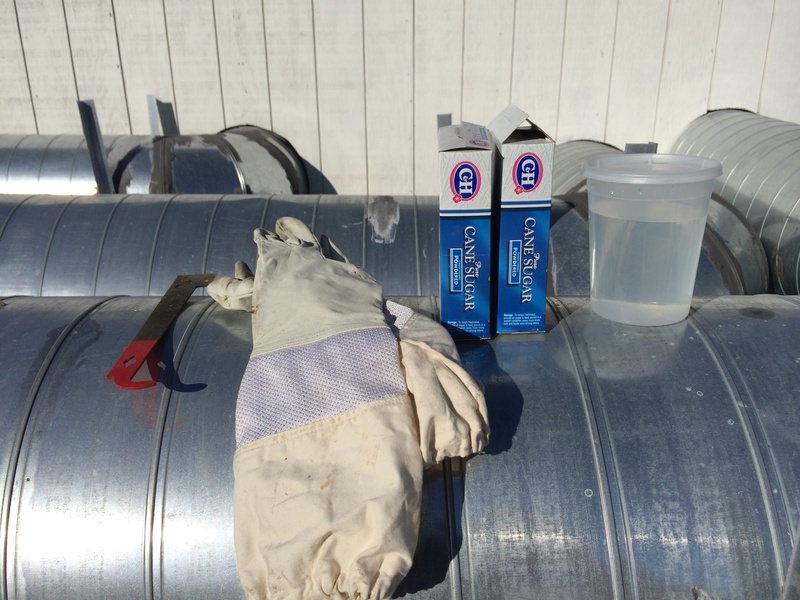 I’ll check the frames for new queen cells – as the hive is likely trying to raise a new queen. I’ll update tomorrow on what we find.